Forget about scanning and printing. Electronic signatures will take your digitization process to the next level — and streamline your contract workflow. The cost savings are significant! Precisely allows you to create electronic signatures on a limitless number of documents. Close deals, execute contracts and onboard new hires quicker than ever before. No more paper. To send a document for signing, click Projects in the top menu. 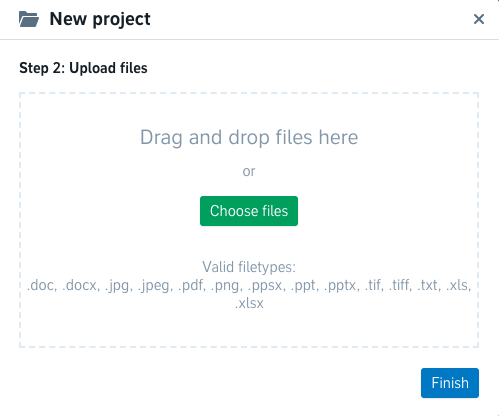 Then, click the green New project button to the top left to create a contract from a template, start blank or upload a file of your own. Note: By choosing Upload and sign, you can easily import an existing document you want to sign instead. Once you've created a contract from a template (or have uploaded a file), click the Signees button and select New. Then, enter the information about your recipient name, email address, organization and role, and click the blue Create button. PS. Your counter-parties do not need to have a Precisely account in order to sign. They basically only need a connected device (e.g. smart phone or computer) with internet access and an email address. Once the contract is created or uploaded and the signees have been added, click the Send for signing button to fill out your message to the signees. Then click the blue Send for signing button to send the contract for signing. Simple as that. Pro tip: Tired of writing the same signing message over and over again? You can create signing message templates to be reused each time you send the same type of document for signing. 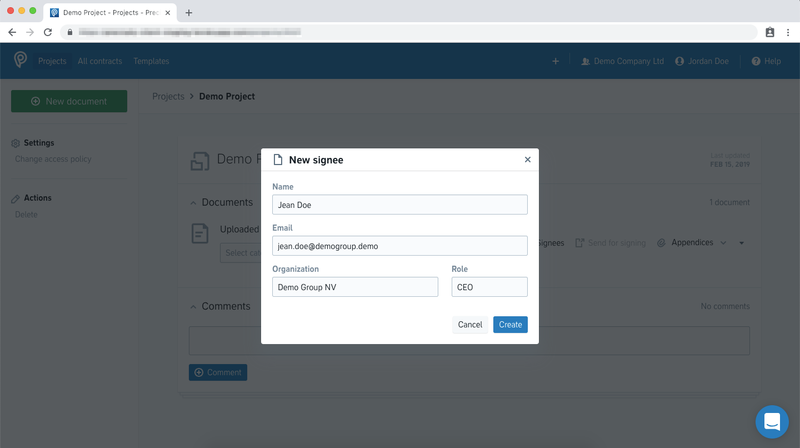 After clicking the Send for signing button from the project overview and filling out your message, simply enter a name for the message and click the grey Save button. The saved message will appear as an option in the signing message dialogue next time you send a document for signing. If you want to manage your saved messages, simply click Manage saved messages. You can also manage your saved messages by clicking your name in the top right menu and clicking Settings. Your saved signing messages can be found at the bottom of your user settings. 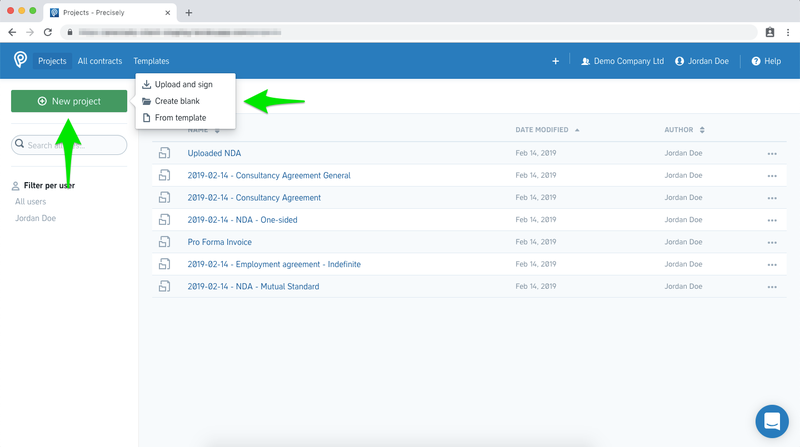 Protip #2: If you have members of your team who are responsible for signing certain types of contracts—such as your CEO, your board of directors or heads of departments—you can add them as default signees to your template. 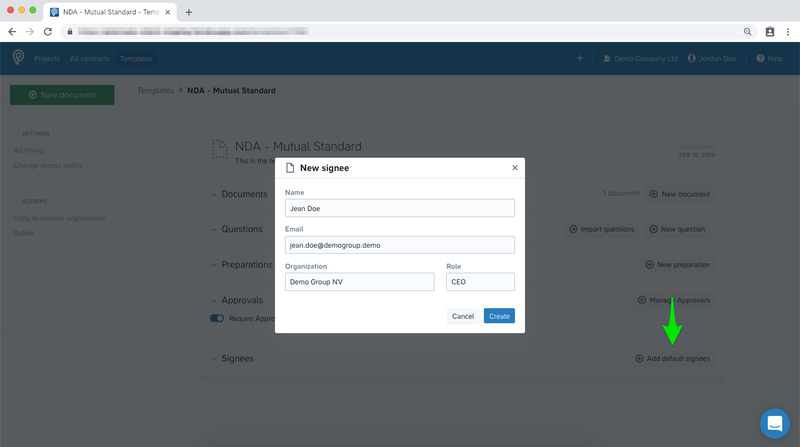 When added as a default signee, they'll automatically be added as signee to contracts that are generated from that template. In the template overview, click the Add default signees button. Then, fill out the information and click the blue Create button. Once all recipients have signed the contract, it'll automatically be transferred to your digital archive. We'll also notify you once all parties have signed the document. No more printing and scanning. We often get the question whether electronic signatures are legally binding or not and the simple answer is: yes! Electronic signatures from Precisely are legally binding in 99,99 % of all cases. They are compliant with regulations within the European Union (see Regulation No 910/2014 – eIDAS) as well as in the U.S. (see Electronic Signatures in Global and National Commerce Act – ESIGN and Uniform Electronic Transactions Act – UETA). What about the other 0,01 %? In some rare cases, there are provisions in specific laws stating that the contracts need to have a certain form (e.g. that they have to be written and signed on physical paper). In Sweden, for instance, it’s basically only relevant for purchase agreements regarding real estate and site leasehold rights.